It’s difficult to manage a team to achieve an organization’s goals. Making the challenge more difficult is the fact that the new global workforce may be based in several locations. In the same office or not, one thing remains the same: Effective and successful teams are essential to your organization’s progress. Learn how to build a great team. LEARN TO BUILD AN EFFECTIVE TEAM. Team building is one of the most valuable activities you can do for your organization. It is important for team leaders to shape a group of individuals into an integral unit, so the team can work toward organizational objectives and goals. BUILD A TEAM WITH GREAT CHEMISTRY. Identify the core characteristics of individuals and use those to build a well-balanced, more productive, and efficient team. LEARN HOW TO HANDLE TEAM CONFLICT. Inspire individuals to look beyond differences and work together effectively. BUILD EFFECTIVE RELATIONSHIPS WITH REMOTE TEAMS. 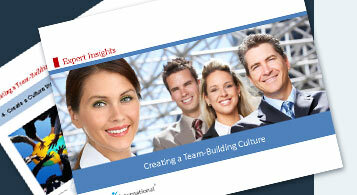 Team leaders learn the most efficient and effective ways to manage teams in any location. Thousands of organizations use Profiles Team Analysis Report from the PROFILES PERFORMANCE INDICATOR™ to promote organizational excellence and superior, effective teamwork. The assessment is a tangible and valuable team development tool for strengthening any work team.